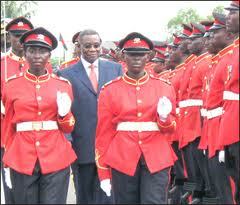 President Mills inspecting a parade at the ceremony. The parade which coincided with the 50th anniversary celebration of the GMA was attended by a host of dignitaries including Former President JJ Rawlings and Nigeria's former heads of state, Generals Olusegun Obasanjo and Yakubu Gowon. President Mills said the Ghana Armed Forces has an image that flies high and it was the military’s sacred duty to continue to pursue high standards of professionalism and be dedicated to the protection of the constitution. He said the government was committed to expanding and strengthening the navy and air force to prepare them to the oil and other allied resources and also prepare them adequately to make Ghana unfriendly for narcotic drugs trade. He also promised the government’s resolve to support military training and collaboration with other African countries so that the effort to get an African Standby Force could be realized. He said the government had taken steps towards resolving the housing challenges facing men and officers of the military, and assured that those measures will yield dividends in the not too distant future. Brigadier General O.B. Akwa, Commandant of the GMA counseled the new officers to strive to develop an atmosphere of trust, honesty, respect and condour.